If you tend to run the battery out on your iPhone at really inconvenient times when you aren’t around a charger, you might want to consider an emergency charger. Actually this will also work with many other iPods as well. So when you’re in serious need of some battery life, you can just pull out this 1cm thick charger and charge it up again. Since it is so small you could easily keep it in your pocket or a purse. The charger will work with the iPhone (all versions), iPod Touch (1st and 2nd gen), iPod Classic, iPod with video and finally the iPod Nano (4th and 3rd gen). Although I can’t think of many times when I was in an emergency situation where I absolutely had to have my iPod up and running. 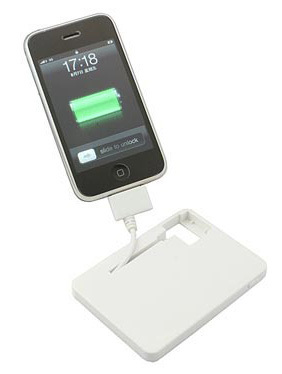 However, iPhone users will probably get plenty of use out of something like this. It has a built-in LED indicator to let you know it’s charging. To recharge the emergency charger, you can either plug it into your computer or into the wall with the included AC adaptor. You can purchase it for $24.99 from USB Fever.